Which are the most friendly Amish communities? Yes, to answer that question we do have to generalize. But I think it’s true that Amish communities can take on a certain character. If you’ve visited more than one Amish community and met enough people you may have noticed this. People in some places just seem more happy to see you than in others. Below are my (non-scientific) choices for “most friendly” Amish communities. And here’s my disclaimer: Obviously, I haven’t been to every Amish settlement (there are almost 500). But I’ve been to nearly all the largest ones, and quite a few of the smaller, covering many affiliations–over 50 communities in all. And in many of them, I’ve met dozens if not hundreds of people, by virtue of a job I once had (selling Bible story books). Enough to form an impression. At the end, I share a few that didn’t make the list–and why. Daviess County, Indiana – Southern hospitality in southern Indiana. I may be partial since I grew up hearing southern accents. These are probably the easiest folks to speak with of any Amish settlement I’ve visited. I met the Amish of Daviess County early, shortly after I first stumbled across the Amish over ten years ago. Other Amish talk about them for their cordial nature. Hicksville, Ohio – In 2006 I spent eight weeks in the Elkhart-Lagrange, Indiana settlement. There are random scattered people living there hailing from Hicksville in northwestern Ohio, and I would meet them from time to time. Whenever I did, it was always the friendliest person I’d meet all day (and it’s not like the northern Indiana people are unfriendly themselves). But this was another level of friendliness. Later I visited the Hicksville community and confirmed my impression. Tiny settlement, must be something in the water there. Holmes County, Ohio – I visit Holmes County often. With Amish from around a dozen affiliations, this is the definition of a mixed bag. But there are quite a lot of friendly people here. People say New Order Amish are among the most welcoming of outsiders. Holmes County has the largest New Order population. Overall it’s a pretty laid-back place and still quite rural area, at least compared to other large Amish settlements. Somerset County, Pennsylvania – Technically, I’ve never visited this place–and I may be totally off the mark here, but based on a series of phone calls I made last year, these are super-friendly people. I spent a few days making random calls to the community trying to track down an Amish business. The people I got on the line wanted to talk and talk with this random stranger calling from North Carolina. Somerset County is southern Pennsylvania, but they have a southern-ish drawl here too, which maybe activates my aforementioned southern drawl bias. I can say after one of the calls I hung up feeling I’d be a welcome guest at that farmer’s place anytime, and we had been total strangers 20 minutes earlier. Small sample size, but the impression was strong enough to make this list. Pinecraft, Florida. How could you not be a cheery soul if Pinecraft were your home, 365 days a year? And the Amish you meet here who are just visiting, are on vacation! So they can’t not be in a good mood. So those are my picks. Who would you put on this list? Not to disparage anyone, but you may now be wondering which communities I haven’t felt so warmly received in. Well, I didn’t put Lancaster County up there, but not because it’s not full of nice people–some of my best Amish friends (maybe I should just say “best friends” and leave out the “Amish” bit) live there. But, I believe on account of all the tourists and being under the spotlight, the average Amish person you meet in the community is not quite as outgoing to outsiders as compared to other places. Some certainly are, especially if you meet them in a tourist context (I’m thinking buggy ride guides or waitresses). However, Lancaster Amish are spoken about for their hospitality by other Amish. One of my Holmes County friends says they do hospitality to a level not seen in his own community–really rolling out the red carpet for visitors. I would agree, at least on the Lancaster part. The least welcoming places I have experienced were Geauga County, Ohio, and Allen County, Indiana. This was again in the context of selling Bible story books. In Geauga County I was blasted off the front porch on a number of occasions. And you might be thinking, well, salesman, he deserved it. But you have to understand that I was not a pushy salesperson. In fact downright the opposite. Not to brag, but Amish in other places complemented me all the time on this. It’s why I was able to do well–letting people buy rather than pushing for a sale. I think the Geauga folks must get an inordinately high number of salespeople, however, because that didn’t really happen anywhere else. The “toughest” Amish in my book, towards outsiders, are the Swiss Amish of Allen County, Indiana. You just felt a shell that was tough to crack. Something silent, in the body language or tone of voice, repelling you. Eventually I must have cracked the code, as they bought lots of books from me. I think they started to soften once they saw I had been around awhile. I’m also going to say I found some very warm people in both of these communities. And admittedly “friendliness” is in the end a rather superficial way to judge someone. I suppose I can’t really blame anyone if they want nothing to do with me. But my impression of the overall character, after a couple of weeks in each place, is what it is. So…would you agree with these? What other Amish communities are friendly (or not so much)? Image credit: Lancaster couple by Ed C.
I agree with your assessment overall, that within every community there are the good and not-so-good. I also agree about your point of Lancaster County, which, by the way, is the only settlement I’ve ever been to. I think these folks are weary of the tourists, especially after the movie The Witness”. I have also gone to several Amish-owned fabric stores, and found an even mix of friendliness. I love these articles, that I first find on Facebook. Thank you! What We see is Amish Ladies Not to Kind unless they have a business. They will not look at you or talk to you or hold the door for you. Kid and Men are Not like that. Do their church tell the ladies act like that? Guy, that has certainly not been my experience. Some may be a bit (or a lot) reserved, but a hesitance to be forward with a stranger is not necessarily rude. I don’t know which community you are dealing with but what Mark says is true (he would know), generally women are not as forward with outsiders particularly men, and men will be more so. You say that Amish ladies are rude. Is it rude or reserved? I also don’t see why you are suggesting that Amish aren’t Christlike but with their own people. Don’t expect that all Amish are automatically going to be warm and outgoing to people they don’t know. More traditional communities especially tend to be less like that. Am just saying that slamming the door on my wifes face and Not even look at us is rude by any kind of people. Okay, maybe in the lack of specifics above, I assumed too much about what was or was not involved. If so, my apologies. When you wrote you don’t see that with the Amish beside their kind, it sounded like you meant Amish people in general. Don’t take the rude, un-Christian behavior of one or a few and think it shows how all will or do act. The only (no, I won’t write it — don’t want to offend) I ever met was very rude, but I figured he was either just a naturally unpleasant person or having a bad day and did not represent all ____. For the rudeness you experienced, I am very sorry. I can promise you we are not all like that. Reminds me of what I have often heard an older bishop say: We do not all bear the blame, but we must all bear the shame. It’s not fair to judge all of a group by the behavior of a few. In every walk of life you are going to meet some who are rude, arrogant, indifferent, angry, friendly, kind, thoughtful and so on. No matter which group you are trying to classify, each person is an individual with an individual personality. Unfortunately, you encountered someone who may be especially shy or rude or perhaps has had an unpleasant experience with an English person. Guy, just because someone is reserved doesn’t make them unloving. In fact, my studies (as a preacher for some three-and-a-half decades) suggests that the Jews women of Jesus were likely much the same way when it came to conversing with a man on the street (esp. if she didn’t know him) — and we find nothing in Jesus’ word to condemn such behavior. For my two-cents-worth, if Jesus wasn’t critical of such behavior, then “being Christ-like” (as you expect of others) would have us doing the same. I have lived in an Amish community for over 20 years in Verona Mo…..They have been wonderful Neighbors and friends .. they not only take care of their own but the English community as well..several years ago we had a terrible tornado rip thru our area… my Amish neighbors were some of the first to respond to neighboring towns with their chain saws and grit to help folks getting trees off homes and road ways … their wives made rolls friend Chicken and other goodies to hand out to folks in need ..one time in the winter a large semi truck went in the ditch a couple of the Amish got out 4 draft horses and pulled that semi out of the ditch….the Amish women may seem stand offish.but don’t take that as rudness…they are brought up basically in and around the home ..they don’t have as much contact with the outside world as do most of the men ..once an established friendship is made these ladies are very open and fun .they will tell you Amish are not perfect just like any other human….we are not perfect just forgiven and we all fall short of his glory …. they are a peaceful people and do not try and push their beliefs on any one……one time a little 6 yr.old Amish girl was crossing the road to the mail box … a trash truck was coming down the road the little girl was struck and killed …. several days later at the funeral the English man(the driver ) and his wife were asked to attend … after the service back at the farm …the father grandfather and couple elders in community gathered with arms around the driver prayed with him and told him they forgave him ….there’s a lot we could all learn from the AMISH ..! I wish people would not generalize and lump together every Amish person in every community. Friendly up-votes or not, there will still be some in the friendliest communities who don’t fit that description. Likewise, living in Lancaster County, I can say that our neighbors are Amish and are our good friends. I’ve had them knock on the door, sharing fresh baked bread, jams and cookies and invited us to their home. As I said, it’s not fair to generalize an entire community. And yes, some are very reserved. I smile and respect that–and 99% of the time, I get a smile back. Maybe at times, we need to be the first to extend a friendly gesture. I have visited 26 Amish communities (5 large, 21 small)in 6 states. Of large communities, I have found Daviess, Co., Indiana to be the friendliest, and the New Order community at Salem, Indiana (Rosebud), to be the friendliest small community. Yes, I think it’s more that way in the heart of the settlement. It’s just not that rural a place either and I think as you move to more and more people in a limited space it naturally goes in that direction. It would be hard work to wave at every car that passed on some of the roads in Lancaster County 🙂 I do think friendliness or openness to outsiders is a different matter than hospitality. I love visiting in Lancaster. Have you been visiting in Wisconsin? There are several settlements both large and small, and we have friends in several of them. I have invited myself in a few homes unexpected, and we end up sitting at the kitchen table having coffee and starting a new friendship! A friend says to me,”Only you would do something like that!” A lot of that comes from my upbringing in a small Wisconsin town where the doors were never locked, and someone often stuck their head in the door looking for a cup of coffee. I have not been to Amish in Wisconsin, Terry, have met some Wisconsin people in other places. I like your story, it sounds like when you decide you’re going to make friends with somebody, you make it happen! Erik, you are spot on! Two of my newest Amish friends are scribes in the Budget that I receive. I found their Budget letter of interest so I went looking for the writer. The rest is history! lol! Hmmm. I wonder if the Amish find “English” in (or from) certain areas also “friendlier” than others. And I wonder what areas those might be (less friendly if from a big city in a northern state? More friendly if from a small town down south?) Do any of you who “rub elbows” with the Amish regularly have comments about this subject? I’d be interested! I’ll have to ask my friend in Ohio (who often visits Geauga Amish) her opinion. I do have another friend who felt Amish in general (in a part of Indiana, many years ago) were not very friendly. From learning about various Amish communities, Ordnung, local customs, etc. (mainly from this blog but also from good, scholarly non-fiction books), I can see how an Englisher who visits only one community might come away with a generalization of folks being unfriendly there. I’ve certainly learned that “Amish” does not mean “one size fits all”! I meet a lot of tourists. I always find the Southerners to be very friendly, but also meet a lot of friendly people from all over the US. Is it fair to say those from the South are maybe more outgoing? Mark, being from LA (that’s Lower Arkansas 😉 ), I’m one of the Southerns you refer to. I know you’re speaking in generalizations, but I for one any very much *not* outgoing by nature. And I’m inclined to say that Southerners are not as a whole necessarily more outgoing; rather I think (historically, at least) there is more of a laid-back-ness / less driven-ness, and an awareness and even friendliness of/towards others that may not have been as engrained in other areas. I’ve had lots of close friends that are not outgoing at all, but you couldn’t ask for anyone more friendly. But I also think that many of those distinctions are not so prominent any more and may be fading away, esp. as the rural-ness gives way to more urban-ness and its way of doing/seeing things. It’s nice to finally see somebody on this site from Arkansas. I thought I was the only one. Welcome, neighbor! What part of the state are you from? Oh yeah — been through there a few times. On I-40 towards Memphis, as I recall. Believe that there is a correctional institution there, if memory serves. I don’t know much about the area — pretty much just been there on the way to somewhere else. I’m more familiar with the regions along I-30 / Hwy 67 and the half of the state N and W of that diagonal line. Greetings! I just moved to Lancaster about a year ago from Philadelphia. I don’t know how it happened but so far the only friends I have met and hung out with are Amish. I was so intimidated thinking we are so different. Truth is, I have never felt more welcomed anywhere in my life. I have 4 children and we always get our families together for outings, we exchanged gifts this Christmas. We barter constantly which I love. When I was sick the ladies provided meals and even offered to do my laundry. Moving here has been a blessing. Andrea, welcome to the area. 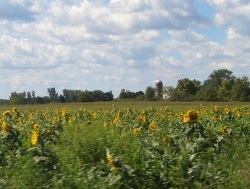 We moved to New Holland about 9 mos. ago. Our neighbors are Amish, some of whom have become our best friends, so I totally agree with you. We have great talks together, we go to lunch and shopping and have the best laughs. Katie once said to me she couldn’t understand what all the fascination is about with the Amish. As she said, “we’re just ordinary people.” But she happily admits that that fascination has evolved in the Amish benefitting financially. The tourist areas teem with Amish wares, baked goods, restaurants boasting their PA Dutch specialty dishes and even buggy rides. Why shouldn’t they reap these benefits? I’m thrilled for them. As far as her question, I tried to explain to her that it’s hard for people to grasp the simple way of life they embrace, but also told her that I believe perhaps there is a degree of envy for their incredible family life, respect for each other, enjoying simple pleasures, their ability to accept people without judgment and full forgiveness, all of course, stemming from their love of the Lord. I feel like you do. Glad we moved here from Delaware! Neat to hear you’ve had a good experience Lor! In Jamesports, MO, they are really friendly! People would sit and talk with us all over the place there and they seemed happy to see us (even if they weren’t selling anything). My question is, do you notice a difference in friendliness based on their level of ?? conservative-ness? Does that make sense? We love to go to Bowling Green, MO, and the people are nice, and we also do business with some of them, but they’re not overly outgoing, especially to strangers. It’s also a more restrictive community. After we’d been to Jamesport a couple times, we wondered if maybe since they weren’t so strict there (even though both communities are considered Old Order) they felt more free and just seemed to have a higher contentment level. I could be way off base, but I was just curious if that ever seemed to play a factor? Beth, I have been to both of the communities that you mentioned (Jamesport many times, and Bowling Green at least three times), and would generally agree with the way that you’ve described it. A couple of things that may come into play here. For one, Jamesport has a history of the Amish and the English “growing up” together that is not so typical in what I hear of other Amish settlements. For years the Amish there attended public school with the English, and seemingly that made for less of an us-them barrier. Also — and possibly going hand-in-hand with that — the Amish in Jamesport are much more tourist-friendly than anything I saw in Bowling Green. Having tourism allows the Amish there to not have to travel hours away to a construction job or something else, so since it allows the families to stay more intact it is more accepted than it would be in some areas. So I think these two elements are factors in the differences that you noted. However, I would also add that I have found friendly people there in Bowling Green as well. I don’t recall the gentleman’s name, but he runs a woodworking shop and his wife keeps a small-shed-goodies-shop stocked with baked good and the like. I’ve enjoyed visits with him the various times that I’ve been through. I have found that the Amish in Arthur, Illinois are very friendly. I try to make at least 2 trips there every year. Being from Daviess County, Indiana originally…I will have to agree that all Amish folks in our area were ALWAYS very friendly. We have always enjoyed patronizing their businesses over the years…their goods and services are first rate! When I married and moved to central Illinois and found the Amish in Arthur, Arcola, Tuscola, Sullivan and Cadwell areas I FELT RIGHT AT HOME!!! All the shop keepers in town and rural businesses are delightful. As you meet buggies, bicycles, pony carts, etc. they nod their heads at you. LOVE going into Amish country to watch the farming…their “old fashioned” ways of doing day to day chores is a wonderful contrast to the fast paced hectic lifestyles we “english” live. They know that in treating people well they will have return customers who they will consider friends through mutual admiration and trust. I haven’t been to very many Amish communities, as there are not many near me, but the people in Ethridge, Tennessee have always been very friendly and easy to talk to. Adair in a comment above Beth asked about whether more conservative churches are less outgoing to strangers, and with my experience with Swartzentruber Amish I’d say that is true, though I found the people at Ethridge to be among the most outgoing I’ve met from a Swartzentruber church. Being a Holmes Countian by birth and a frequent return visitor I can tell you that the Swartzies of Holmes County are anything BUT friendly. The wonderful exuberance and curiosity of youth. That is a nice story. I do not profess to be an expert but children of this age will certainly behave differently in that situation when Mom and Dad are not around. (Especially in the absence of a Swartzie father). I find the comment about the kids acting differently because the Dat isn’t there to be very Broad and even speculation ~ my special Schwartzentruber family act the same all the time. The Father extremely friendly and kind as well as the Mother and Children. Eric, I’ve been at this less than half the time that you have, visited some half of what you’ve been to (34 settlements in 8 or 9 states so far), and had far less one-on-one contact than you have. (Sadly, not being a people person myself, it took me a while to get past visiting a place to “look at them” and actually visit with them.) Most of those places involved a single visit lasting from an hour or so to possibly a day, it’s really not fair for me to evaluate a community on so little person-to-person data. And I’ll be honest, there is something within me that wants to let a community’s level of “strictness” automatically lower their level of friendliness. And yet when I think about it, my experience has shown that that is not a valid approach. Case in point: Clark, MO. Probably the first place I visited that were strict enough that they used the kerosene-burning lanterns in place of electric flashers. The situation felt uninviting to me…, and yet it was there that I had a buggy full of folks (young people?) wave at me like I was a long-lost friend, where I sat and talked for probably half an hour (and would have been much longer if I had had time) at his leather shop, and visited with a handful of store keepers — with varying degrees of friendliness. The Swiss (?) Amish of Seymour is much the same way — the uninviting “lay of the land” is too easily mistranslated into unfriendly. My 2 or 3 short visits there regrettably involved little person-to-person interaction with the Amish, but that little bit included a very, very friendly farmer (who sold soap made from the milk of the sheep that he raised) and a very, very reserved younger lady at the local Amish variety store — both ends of the friendliness spectrum. Contrast this to the Berne / Adams Co. (IN) group from which most of the Seymour settlement migrated from. The tone* there seems to be strict-yet-warm-and-inviting — and it seems to come across in the people as well. One of my all-time-favorite stops has been with John Schwartz, a octogenarian (I’m guessing) deacon who runs a once-full-service shoe shop out of his shed. John is the only Amish person I recall visiting that has weeks later called me up for no specific reason just to say hi — and that’s got to equate to “friendly” in anyone’s book. I am at first inclined to put Mt. Hope (Holmes Co., OH) and Lancaster Co. on my friendly list…, but that may be because of the very friendly hosts that we have had there. But it’s not quite fair to evaluate a community by one family that is outgoing enough to pursue the job of hosting strangers every night. I will say that in Lancaster Co., going from the outgoing hosts to the two Amish churches they they took us too — that took us beyond the superficial. Like a junior high dance (not that I’ve ever been to one), there was initially a strong sense of “what am I (or they) doing here?” from both sides, but before it was over I felt a warmth and friendliness from the folks. But of all the places that I have visited, the only place that I’ve been to enough to actually make real friends is Jamesport, MO. If one judges friendliness by warmth and outgoing-ness towards an individual you don’t know, then Jamesport Amish are probably about average-to-slightly-above-average. However, if you measure friendliness by a perspective that is more than just a smile and a friendly hello, but is open to accepting others as genuine friends — well, Jamesport has to be one of the best places I’ve been to. But then again, I might find other places equally friendly in that way if I could invest the same time and personal involvement. We have been almost 30 years involved with Lancaster County, first visiting (almost 10 yrs), then moving there to join a plain Mennonite church (16 yrs). Then moving away because of job loss to a new state (last 3 yrs). We are still in plain fellowship. If I had it to do again, I think we would have gone to the Beachy Amish churches instead of Mennonites. The Amish we have dealt with of various groups have been on balance more friendly than the plain Mennonites, perhaps because of their church structure. The Mennonites in many places are descended from the Lancaster County group who have a “strong bishop” and are hierarchical and more authoritarian. The Amish we have known even the plainer ones are more friendly to whatever level, but they are also more congregational and the ‘power’ is distributed more throughout the congregation. The plain Mennonites who are visible because of their dress were a conservative split off the larger body that had assimilated in American culture and lost their distinctives so they are defensive about maintaining their practices. The Mennonites have split 10 or more different ways trying to “get it right”. There seem to be fewer Amish based ‘denominations’ as it were, and perhaps the mix of opinions helps to keep them more flexible and less rigid. We have also visited in OH, IN, VA and IL for our daughter’s different youth activities and visiting so we have some familiarity with other groups. One last consideration, at least in Lancaster County, there seems to be a fairly high number of people who seek out the plain churches and sojourn with them for at least a time. We have known quite a few Plain people who were taken advantage of or hurt unintentionally, so perhaps groups that are more isolated and have not had bad experiences might be more open. We try hard to observe the protocols and not step on any toes. Really interesting comment Paula, I don’t really know conservative/Old Order Mennonite churches well. I can just chime in that the ones I approached during my sales days were probably on average more difficult to approach than the Amish in the same community (in Lancaster County mainly). In the Lancaster community at least there is effectively just one affiliation among the Amish, while there are multiple conservative/Old Order Mennonite churches, so there might be something to what you suggest about being more flexible. Thanks. Don thanks for your comment. I read it with much interest. I think you are right that it can be subjective dependent on a lot of factors and it’s probably not wise to judge based on limited contact (though admittedly I sort of did that with Somerset County above, I guess I was impressed by the folks in my small sample size…hope someone who knows Somerset will back me up 🙂 ). It was interesting to read what you wrote about Berne, like Allen County they are Swiss too but I’ve had just limited contact there at some of the businesses. I’ve had very unique (though admittedly few) experiences in this area. After our son became Amish, it seemed the community he was involved with treated us as “part of the family”. This was a better experience than we’d hoped for. Then my running buddies and I went to run the Bird In Hand half marathon in Lancaster. This is where it gets strange. I found myself running with a friendly Amish family (mom, dad, a couple of teenage children) and found them to be open and un-guardedly friendly. After a few minutes of chatting, I mentioned to them our son’s situation, having converted to the Amish. That was the wrong thing to do! They gradually slid to the other side of the road and made it clear further communication was not invited. Later that day when in a fabric shop, the same thing happened with the gal behind the counter. I have no way to explain this! I’d evidently crossed a line they could not tolerate. When visiting Amish families in Fertile, they treat us wonderfully as I said earlier. Ed told us that the specific families who (always!) invite us over, are also a bit on the fringe side of the community. They are the ones who toy with modernizing more than others. Ed says he thinks they feel some sort of connection with us, or just want more insight. He told me that once you are “in” the community, you find out quickly how to rank different families; where they fit on the question of “how much to modernize” is about the most important factor. Very interesting comments everyone, thanks! I’m going to guess they became less comfortable with that info because it probably caught them off guard and made them feel less secure in knowing who they were dealing with. I think that in a way dealing with English people who know little about the culture is less threatening because as an Amish person you sort of know what to expect from that person–basic questions about why they don’t drive cars or why they wear suspenders or whatever–and the other person is clearly an outsider. When you told them your son was Amish you became something else. I’m nearly 100% sure you were the first parent of an Amish convert they’d ever spoken with (Lancaster doesn’t really attract converts). Sometimes I’ve sensed an Amish person I am speaking with has become more reserved with me once I say something that makes them realize that I might know people they know in another community or that I know something about their church practices or how Amish life works. They first think they know who they are dealing with, then you throw out a piece of information that sort of throws a wrench into the dynamic. Ann, I’m guessing it might be because 2 recent converts to the Lancaster Co. Amish turned out very badly and in both cases (and we know the people personally so this is not gossip) the parents of the men who joined the Amish were very involved in the trouble and in both cases stepped in and got involved. In one case, the man’s parents convinced him to leave the Amish and his wife and take several of the couple’s children, etc. Though that has been several years ago now, it might have put those people on their watch, wondering if this might be something like what happened before. I might be wrong, but I know it was very much talked about at one time. Thank you Mark. I think I like your info better than my theory 🙂 At least for Ann’s situation. I have sensed the second thing happen before when I’m speaking with an Amish person I don’t really know, and I think there’s some truth to it. If they think you are a run of the mill outsider, and then suddenly you appear strangely in-the-know or maybe not an outsider at all, it can catch people off guard. And I can understand that. In reading these comments, I agree with the one point that was made, that just as there are varying levels of acceptance of the English in Amish Communities, so are there varying degrees of friendliness/acceptance of outsiders in ANY community. Another thing that struck me was the comment that Amish women are rude, and as some one pointed out, engage women are generally taught to be submissive and would not engage in friendly banter with men or English women. We had an Amish company from Perry County PA replace our roof. They seemed a bit more open to the English, by the mere fact that they did a lot of roofs in suburban neighborhood, The one thing I noticed, however, was that the men were very reserved with me, but extremely friendly..almost animated.. with my husband. And as I said in my first comment. I go down to Lancaster County as often as I can, and I usually seek out Amish owned fabric stores. The ones that catered to the tourists were generally more friendly, while the ones that you could tell..by the things on their shelves, that they were more geared towards their own kind. That’s a good point Janet, it goes both ways. Traditional gender roles are strong among the Amish at least in the sense that women tend to fraternize with other women and men with men in social settings. You notice this after Amish church when each gender seems to mingle only with others of their gender, and the fellowship meal has separate male and female tables. We have Amish friends, who live in Trumbull County, Ohio…Right next to Geauga County, and they are very friendly. Maybe that’s because he owns a furniture store. I have found other Amish in Geauga County who are friendly, too. Especially those who own businesses. Maybe you just haven’t stopped at the right places! The first Amish person I met from Geauga County was actually a man living in Parke County, Indiana. He was one of the most gregarious Amish men I’ve ever met. Fla to Holmes County to Lancastor, Pa. I think some of it depends on the visitor; how they act, what they are expecting etc. I have found many times (not all) you find what you are looking for. If you are looking for friendly folks, you tend to find them…. Also, if you treat folks with respect, they often are friendlier back to you. If you treat them as a curiosity, then not so much. I have to say, regarding Plain ladies, that many of them are reserved even with Plain men that they are not related to or very well acquainted with. At least that is the case in our neck of the woods… It’s especially true with younger ones. I live in Allen County, IN and agree that our Amish can be rather unfriendly. I especially find that to be true of the shop keepers. Having said that, I have never felt more welcome than I did in the home of an Amish bishop. His wife was amazingly friendly and open to all of my questions. Alice Mary brings up an interesting question in that I would like to know what the Amish take on this is as to where the friendly English folk come from. Esp. those in the Holmes Co. etc. that get a lot of tourists. The Amish folk here in Ft. Scott, Ks are quite friendly, always wave and say hello, always ready to help an English neighbor out or stranded motorist. I recently attended an Old Order Mennonite service in Rich Hill, Mo. and was surprised how warm and welcoming they were, they really went out of their way to make me feel welcome, had a great chat after church and some of the younger men took me out and showed me how to drive a buggy. Really a wonderful experience ! The friendliest strangers I ever met were from Cambodia. It is easier to say where some of the unfriendlier visitors come from, but that would be rude. Since we meet people from all over the world, we get to meet friendly people from all over but I think that a trip to a place like this might have more appeal to a certain kind of person, not? It has been years since I was in college. But one of my favorite classes was on Religious Communities. A bishop of one of the districts in Daviess county welcomed our class into his home for a visit and question and answer session. His family was very cordial (and patient with our ignorance). I would love to meet someone from the Amish community. From what I know of it, the culture is admirable. 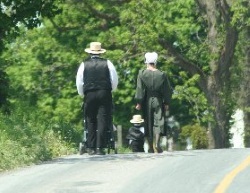 I am fascinated as to how the Amish live their lives in our fast moving modern world. Greetings from England. Welcome, Stella. We love our international readers. You’ll probably have to go to the States or Canada if you’d like to meet someone Amish. Interestingly, there have been a couple of Amish-related programs made by UK production companies and I think one involved bringing Amish youth to England. Another is called Amish: A Secret Life which is more about a family leaving the Amish, but it is pretty well-done. I have met with Amish mostly in New York and some in Pennsylvania. I only had one lady that might be considered rude and I can’t really say rude. It was before I knew Amish, their beliefs and ways than I do now. I got out of the car with a camera around my neck and was buying baked goods. Another Englisher explained that the Amish do not like their picture taken, which I didn’t know, but wasn’t going to take the picture. I put the camera in the car. The Amish lady never spoke to me the many times I was there unless she had to. Now I leave my camera in the car when I am going to stop at an Amish store or stand. If I want pictures of the building, I ask first and tell them my camera is in the car. If they want to see the pictures after I take them, they can. I never had anyone that wanted to see them – but I offer. Being a woman, I have never met with either a man or women who was rude or wouldn’t talk to me. I was intrigued to read this essay, and wondered where you would rank the Amish of my area in the Lagrange/Elkhart county area of northern Indiana. I’d have to say that your decision not to have them on either the “most” or “least” friendly list was probably right on target. I generally find that if you treat Amish in our area like normal people, then they treat you like normal people. Most people around here (Amish or not) are not wildly outgoing, but also not wildly rude. You don’t generally start up conversations out of the blue with strangers, but there’s always a smile between salesperson and customer, and an actual discussion is not out of place when you happen to have facing seats on the South Shore (a train that runs between South Bend and Chicago; I was once on it at the same time as a school group of eighth grade graduates from an Amish school, and their adult chaperones). Amish children do have a tendency to stare that an English child of that age would be told is rude, but I don’t think there’s any hostility in it, just open curiosity about people who are different from them. Truth be told I’ve found many Amish communities to be full of friendly people, the ones mentioned above have just stood out for one reason or another. I have definitely felt welcome in Northern Indiana. The Amish people I’ve known in Holmes county have been lovely and kind in general. I’ve met only a few people in the community in Randolph Mississippi and found them far more reserved. One woman was down-right chilly and wouldn’t exchange more than a word of two with me, as I visited the jam shop she ran near her house. Another woman, who was from Ohio, but had moved to the community was far friendlier. Well, I think you’re all wrong. The friendliest Amish community has to be Belle Center, Ohio. It could be I’m a tad prejudiced since my son is a part of that community but they’ve always been great to me and to my wife when she was alive. I am glad you added Belle Center Don. They get at least an honorable mention. I only have met a few people on my visits there (besides Mark of course) but they were certainly friendly folks. They fed me well too. Don, would you mind dropping me an email? I used to have a connection there with the Belle Center community, and if you’d ask your son about them, I’d be grateful. I’m really surprised the Shipshewana/Nappanee area of northern Indiana is not judged as very friendly. We have visited the area often and have encountered nothing but warm friendly people who are easy to talk to and with whom to do business. I love going there to visit relatives and to visit the local Amish businesses. They’ve always been warm, friendly and somewhat outgoing with us. I hope my comment in the post wasn’t misunderstood (“it’s not like the northern Indiana people are unfriendly” in other words I think that they are friendly). I met a lot of nice people there in 2006 and later visits, and found the people there quite outgoing towards non-Amish. I have some friends and acquaintances there too. I live near the Amish communities in Buchanan County, Edgewood and Hopkinton/Delhi Iowa. (All in NE Iowa). I have never encountered anyone who was rude although I do find the women to be very reserved. One exception – a lady who runs a quilt shop in Hazelton/Buchanan County. She was funny, welcoming and very friendly. Of those 3 communities,I find the Buchanan County to be the most outgoing but that may be because of the number of “English” who visit their many shops. Robin, I agree that the Buchanan County Amish are quite friendly. I have no experience with any other settlement, but I feel that most people in this community are quite approachable. I have noticed that the women who run a business are more readily engaged in conversation than the farm wives that I know. It makes sense because they are used to talking to outsiders all the time. I have visited Holmes county area numerous times and have never met a rude Amish person. While some may be reserved, rude is not how I would describe them. I think sometime we “English” people may over step our good intentions that these people are not accustomed too. Like being too friendly, etc. I have also been to the Shipshewana/Nappanee areas and again very friendly. My amish area her in Canada (St . Jacobs Ontario) the amish and Mennonite are very friend but also reserved. I have been friends with many of these people for over 20 years in both Canada and the USA and value our friendship dearly. I love to visit the Amish in Ms!!! First went to Eldridge, Tn, nice visit. The most memorable part was the English lady who married an Amish man. She was sweet as pie and her bread was awesome! Her husband built furniture, really good furniture. And the sweet smell of the cantaloupe drew us to the table like we never knew melon to do ever before! But the Ms Amish are my favorite. On my last visit I got one of the last jars of sorghum and the man had just harvested honey. I usually get honey, but it wasn’t ready, besides sorghum was what I wanted and never could find in all of my visits. My daughter did not even notice the hive boxes she had walked past so I made her go back. The Amish man was tickled that she did not know what they were. And he took the time to explain how he harvests the honey and pulled out a tray so that she could see. I learn something new every time I visit. Some people are just quick to tend to me and rush back to chores, others tell what is going on with family. But that is how it should be, first family, chores ect. Chats when time allows! I confess I did not read all the comments, but would like to make two observations–well, three if you count my comment title. The second is that I’m convinced our own attitudes, demeanor, and practice will dramatically affect how the Amish respond to us. I would concur that in general I find the Amish “reserved.” But I have had them initiate conversations with me and have never been treated rudely. One of my funnier experiences was a conversation with an Amish child as I walked by their farm. She spoke to me at some length, quite animatedly… of course she spoke totally in German. I had no idea what she was telling me but I replied in English making hopefully the right gestures and she seemed quite pleased! The third is a comment I heard years ago… a farmer who said “If I stopped to wave to every one who stops to look at me and/or wave, I’d never finish plowing my field.” That said, another time I was walking by a farm where a young girl was mowing the lawn with a horse pulling a cobbled togeher riding mower deck. I was impressed with the corners they were taking… stopped to pick up an empty bag on the lawn that would have been in the way and got a huge wave and smile as wound round the bend, clearly enjoying the ride. As we think about the Amish, we might also think about ourselves. We are all just people. "we are just people" Yes, that matches my experience! That’s how I have found things in my own neck of Amish country. The Amish are a bit more reserved than most of us English, but most of us don’t have to live with the delicate combination of trying to live a life of humility while looking so different from the surrounding population that we’ve become a local tourist attraction. If you treat them as normal people, they treat you as a normal person. As “normal people” in Northern Indiana are in general neither exceptionally outgoing nor exceptionally rude, so it is with our Amish. We are all just human, so true! I lived with the Amish for a time when my life was in shambles. I wish I could live with them forever, but we agree that the Lord has plans for me elsewhere. First, I with one of my children trying to help her financially and show her the changes in me that only came from God who used the Amish to help me transform into a very different person. The most difficult practice for me was to learn to be reserved, I’m still working on it in fact even though I no longer live in the community. The peace and love I found in that community is awesome and difficult to explain, but they told me right from the start that they are not perfect, and I did not have to be Amish to be saved and on my way to heaven. The experiences and culture shock took a long time to adjust to, and I say today that was harder to go through that transition then when I was in boot-camp in Fort Dix NJ. I did it all because I wanted to find God’s love and learn His ways and I have no regrets. I was thinking to myself, what would a blog sound like if we would have one for English America, what would the Amish have to say about the non-Amish. Go ahead and share, it was interesting. But Guy might want to start over, as his assumption is incorrect. Guy you met the women on her off day, maybe, or like it was suggested, after a bad experience. women tend to be more open to salesmen, but ask their husband, right Erik? Mary I agree there is probably a lot of truth to the idea that friendly-seekers will find it. I have found the replies very interesting, to hear other people’s impressions. I would again just say that my list is just my own impression, experiences will vary, though I still think that attitudes and customs are infectious and both good and bad ones can spread among a people. One thing I have thought reading these replies is how a stranger’s experience with a member of a given group can leave a strong impression that that person carries away with himself, rightly or wrongly. Even a single experience. This isn’t just about Amish or English but also when you meet someone from a different country, for example. I guess that like it or not we represent whatever group we are identified with. When I was selling books, usually I found that Amish women would want to at least consult with their husbands. Truth be told I think the women often made the ultimate decision, but getting hubby involved was a necessary formality. Your outline, Erik, is what I would expect to hear from a seasoned traveler. I think the statement ‘we find what we are looking for’ is quite accurate. I was reminded of the fact this summer while walking back to the highway (E-762) from Svetog Vasilija Ostroškog, a monastery built into the side of a cliff in central Montenegro. The youngish couple which stopped and offered me a ride were deeply offended by how they had been treated at the monastery. It had to do with the length of the woman’s skirt and the way in which they were offered the garment to wear over the short skirt. Perhaps I was wrong in my assessment. But they seemed like they were easily offended. I didn’t offer any advice. Just tried to be jolly and thanked them for the ride. I think our impressions of the Amish are a bit the same way. I really enjoy the Allen County folks. Partly because I don’t live there. And partly because when I am there I don’t have to worry what I say to them. I can just say what I think and they don’t act surprised or offended. But that’s probably because they do the same in return. But the places which can be both the best and worst places to visit are communities with lots of converts. I really enjoy my convert friends. But they can be the most difficult to get along with. In order to make the jump from society to the Amish, they usually nurtured a bit of hostility toward society. And so they tend to have a harder time blending in. I know that many who have made the transition are successful in their new place in life. But a visit to a community (or church district) with a lot of converts can turn out quite good, or surprisingly disappointing, largely depending on how they are relating to a variety of difficult situations they are encountering. That’s why I like to avoid the label “English” and use “non-Amish,” though I’m sure I use it without thinking at times. I’m sure not all people from Cambodia are the same, but these people just really amazed us. After visiting 22 settlements last summer I can say that smaller the settlement – friendlier the people. For me friendly means open-minded to strangers. Of course New Order are the most open minded and friendly as they mostly use electricity etc (as we do). Some places I really enjoyed this summer and I recommend to visit: Hutchinson/Haven/Yoder and Garnett (Kansas), Opdyke and Flat Rock (IL), Chouteau (OK), Conneutville (PA), Spencer and Hillsboro (WI), Canastota and Lyndonville (NY). I’m glad Janar mentioned Flat Rock Illinois. Nice and friendly small community. i grew up around a lot of amish and even though I didn’t dress like they did and some were even relatives by marriage they weren’t rude…. they just didn’t talk much unless they knew the person and were comfortable with that person. 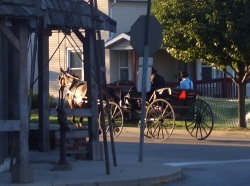 the closest amish community close to where I grew up is a VERY touristy town. the people there are always friendly, helpful and smiling. I cant say much about some of the other communities mentioned in your book other than my aunt by marriage is from Hicksville, oh and I have been around some of her family that are still amish and they were always very nice people as well. Just like any section of society their are people that are friendly and some not so much, and the Amish are no different, and in my experience The Amish in general are very friendly people. I grew up in Hicksville, OH, and even went to school with Amish, (where you consider to be some of the friendliest Amish) on the Stateline Road. Across the road from us, Allen County Indiana (where you consider to be some of the most unfriendly Amish. While, Agree that the Hicksville Amish in general are friendly, several years ago an Amish family originally from Allen County, Indian bought the property next door to my parents, and where I grew up and they have turned out to be the nicest neighbors that could be had. They often invite us down for diner, and at Christmas time we even exchange gifts with them. Oh sure the were hesitant at first because I think that they were unsure of how we would receive them as neighbors since the people who lived in the house before them were not Amish, and once they got to know us they loosened up and even joke around with us, both the man and the woman. I think a lot of times what some may interpret as being rude is just them being cautious because they are not sure how people will receive them, but if people just give them a chance and just respect their way of life they can be some of the nicest people. Good example here Tom. Thanks for sharing it. And interesting to hear about the Allen Co. couple. A store I visited in Hicksville was owned by transplants from Adams County, also Swiss Amish. I have seen the statement “visiting settlements” and am curious as to what constitutes “visiting settlements” and what it all entails. Does it mean just patronizing businesses.. Or perhaps visiting certain family members and or Amish friends living in the same area-settlement? If one plans to take a vacation to visit Amish country for shopping/quilt auctions etc or maybe check out the area for a residential move …what community should a newcomer/first time visitor be directed to?? Thanks for any input that might help a newbie. Beverly, I’m not sure if I used that exact phrase or not — but I do regularly mention visiting various settlements/communities/etc. It’s not like there is a designated visiting area or group, and others are off limits. It’s just another way of saying that I stopped at or took a few minutes while passing through some Amish area. It might mean that I stopped at a store to chat with an owner; on a very few times it has meant that I stopped at the house of an Amish person; I’ve even used the phrase to ref. to passing through an area and snapping up a few pictures and not even get out of my vehicle. I’m not much of a quilt shopper, so others may speak to where the best places might be. I do know that I’ve seen quilt shops in Lancaster Co. (PA), in Holmes Co. (OH), and I think in Shipshewana (IN). These are definitely the more ‘touristy’ Amish places that I have been to. Of these three I like Holmes Co. the best. The Mt. 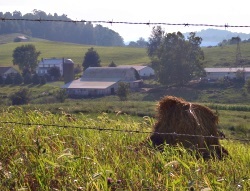 Hope area in Holmes Co. is one of my very top favorite Amish places to go. I saw JANAR’s post mentioning having “visited 22 settlements last summer” and was curious as to what those visits entailed. Like visiting a few different farms,stores, auctions etc..within the same Amish community/location perhaps..outside of say a tourist visiting a certain part of Lancaster-i.e. A Bird in the Hand etc. We visited Conewango Valley, a small Amish community in New York this past fall. It is nothing like Lancaster, PA as far as scenery goes but all of the Amish that we talked to were very friendly and helpful. My husband spent a lot of time in their shops talking horses with the local Amish men and they were very welcoming. We will be going to Daviees and Holmes Counties this summer, so glad that they made the most friendly list! Amish communities in Tylor county and Clark county Wisconsin are the best people you could ever want to live by. I cannot every say I had anyone in the Amish be rude or disrespectful to anyone I no. This is a great place to farm and raise your family and most of all god biding people. Thanks for sharing Erik. With all your travels and communications with the Amish, you would certainly be the most qualified to make a general assessment. I might have mentioned that I took on a job as a guide (just to be helpful, not for pay) for an Italian filming crew that was filming for the 2015 Expo in Italy. The basic subject was food and farming. They have been all over the world. Producer, Director, Writer, Sound man, and Camera man. I explained how difficult it would be filming the Amish, but in general we did well. I did steer them to some Mennonite farms which were naturally more open. Anyway, the point I wanted to make is we did run into several instances of rudeness which I can understand to a point. I say to a point, because no matter what the situation, I could never be rude to another person. One Amish lady open her door holding a baby, and I explained in detail just what we were doing and that it was not for entertainment, but a documentary on how important farming is to feeding the world. She said, “I don’t care anything about that, I just want you to leave the area”….which we did. Another man had a team of horses, and the crew asked if they could film from a distance. He said no, and rudely told us to move our vehicles because it was dangerous to have them parked on the road. It hasn’t changed my attitude toward my many Amish friends….I even mentioned it to one, & she wanted to know where it happen. She knows a lot of people, but it turned out to be a different church group. I’ll be in Lancaster April 13th to May 19th, and if you are in the area, email & I’ll be glad to buy you lunch or dinner. With others on Amish America from that area, it would be great if several of us could get together. I think I can understand, especially if you didn’t have things pre-arranged earlier. I am sure you were nothing but polite but usually a cold call with a camera crew is going to get people uneasy. I think the instances when filming has successfully been done (for instance the PBS Amish documentary) was when it was set up beforehand, at least when permission was acquired. Or, for distance shots, the crews probably don’t ask, which some might prefer b/c they simply don’t have to give a positive or negative answer each of which has its pitfalls. Anyway, thanks much for the kind invite, something like that would be fun. Unfortunately I was just there and probably won’t be back until summer at earliest. I hope further work with the Italian crew goes well. We visit the Amish in Ethridge, Tn and have found them very friendly and helpful! We have a daughter that is visually impaired and one of the guys offered her a light so she could see better in their shop. You want to visit rude Amish try Pontotoc, Ms!!! I’m enjoying reading about the different opinions! I can’t speak for the adult Amish of Allen County but I can say from experience that the Amish children in the area are pretty friendly. Always quick to wave hello if you pass them by. In fact they usually wave first. I remember when I was a young teen and saw an Amish girl probably a year or so younger than me at a store. She smiled so I smiled back and said hello. It was like it made her day and she said”Hello! How are you! ?”very cheerfully like I was a friend. Just wondering if this is other people’s experience? I’ve visited 3 different mennonite communities and always found them very distant. And their women practically freeze when they see a stranger and keep a good distance away. On the other hand I’ve stayed at Elmo Stolls community 25 years ago and the people were friendly and most of the women were talkative and fairly outgoing. So I don’t get it. Why are mennonites different. I’ve visited a mennonite church service here in tennessee and it kind of felt like if I wasn’t one of the brothers, I didn’t belong there. Very unhospitable for people professing to be christlike. Interesting observation Steve, I’d assume you are talking about Old Order (horse and buggy) Mennonites? I have had limited contact with them compared to Amish, not enough to say. A lot of Mennonites feel that a woman chattering away with a male stranger seems “bold” or “forward.” What you might think is “cold” is an example of cultural differences. They are not trying to freeze you out, but are practicing “reserve” and “modesty.” Just my view from the Amish side of it. A relatively new community here in Marathon NY. that grew quickky. They came from PA where land was getting scarce. Some ppl here were worried as they had heard the Amish in northern NY weren’t very friendly. But they had nothing to worry about. They are great neighbors, very friendly with anyone who is friendly to them. Many English here have been included in weddings and visit regularly.Personally, makes me happy to see some of these farms operating again. And love seeing the buggies go by every day. I grew up Amish and left at the age of 18. We my wife and I live in Sherwood, Arkansas. At this time I am 79 yoa and would like very much to make contact with Don Burke in Forrest City, AR. I have a very dear friend that also lives in Forrest City that I go and visit when I can. Would like to make contact with Don Burke if possible. Erik you may pass on my email to Don if you have his email so that he would be able to make contact with me. I have always had good relationships with my family members that are still Amish. Very interesting to read and view other readers comments. Thanks for your email and kind comments Andy. I passed it along to Don. Just curious which Amish community you grew up in? Thanks for getting in touch. Hello Mr. Miller. Erik forward your message to me, and I sent you an email directly in response. I should point out that I do not live in Forrest City — although I do consider myself to be a native Arkansan (from the Hope/Texarkana area). Instead, I live in the small community of Potosi, MO — not far from the St. Louis area.